Since becoming certified through the Delta Society as a therapy cat earlier this year, Aspen has gone to 'work' a number of times at a local nursing facility, which is home to approximately 100 residents (4 floors). In an effort to not 'over work' him, we do 2 floors each visit. On our first visit, Aspen was extremely interested (nosey is a better description) in his surroundings and would have loved to have been able to run around and check every thing out but, instead, he listened to what he was being asked to do and behaved remarkably well...sitting, purring and playing with his dragon fly..his favorite toy..to the delight of many people. On subsequent visits, Aspen now understands what he is expected to do and simply does it. A normal resident visit usually lasts about 5 minutes. Aspen sits on a lap or bed listening to the "oohh's and aahh's" of how "beautiful and soft" he is, while loving all the pets he is getting. If the situation warrants a more active performance, he will run in circles and jump up, endlessly, trying to catch his toy. I answer their questions regarding what kind of cat he is, his personality traits, sometimes explaining what it means to be a 'show cat' and listen to stories of pets they have loved. It is often difficult to take him away, especially when he has decided to fall asleep while cuddling with someone. They say "Oh, he wants to stay with me!" Margaret, one of the aids, loves how he rides on shoulders and she will scoop Aspen up and walk from bed to bed, room to room with him on her shoulders (I smile and quietly follow!). Although we are supposed to be visiting only certain floors each time, there are several people (and that list is growing) who somehow find out that Aspen is in the building and the nurses hunt us down with requests of "special" visits to his biggest fans. And, yes, he does have a fan club..I have given his picture to many of the residents and it is quite comical to walk into many rooms and see MY cat's picture displayed on bulletin boards, dressers, TVs and tucked in corners of family portraits..with explanations given of "Those are the people in my life that I love, and I love him too". This therapy thing just keeps getting better and better... Yesterday, the Alzheimer's lady (from my last story) TALKED!!! She continues to be very alert the minute he sits on her lap and after he was with her for a while, she looked straight at me and said "I love him so much". Several other times she said something directly to Aspen, but we could not understand the words. During last visit it seemed several times like she was going to cry; this time she actually smiled a number of times when she was looking at/petting him. The visits are drawing a crowd - the staff is enjoying her break-throughs and continues to state that the cat is the only thing that makes her alert to her surroundings. She waves bye each time we leave. I promise her that I will bring him back soon, and this time she grabbed my hand and squeezed it. On the funnier side, one lady thought he was "a beautiful dog" but "liked my jewelry better than my beautiful dog" (I left making sure I still had it on!) ...and, boy this was a first....one guy thought he was a badger!!! 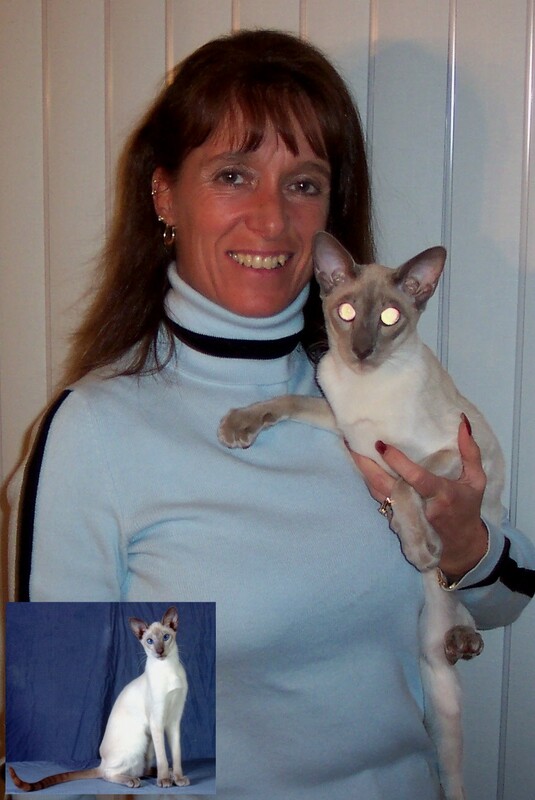 Because a number of people have suffered strokes, their motor skills are impaired, making it difficult for them to 'gently' pet a skinny Siamese. I find it necessary to be constantly alert to this and sometimes have to strongly hold someone's hand to assure that Aspen is not in harm's way. This exact problem was covered as part of the training from the Delta Society. I'm very impressed with the thoroughness put forth by the Delta Society in this regard, as I feel confident that I have been properly educated on situations to watch out for and how to handle them kindly and correctly. Not only does Aspen glow in the light of many a smile, he has also created some happy tears. As a victim of stroke who rarely smiles and is not able to speak, he was quietly curled up being petted on this woman's lap; she had a smile from ear-to-ear and was 'belly-laughing'.. the whole time with tears of joy streaming down her face. Aspen now probably knows the entire life's story of this lonely, old Polish woman who speaks no English and was unable to converse with the staff. He sat on her lap, they stared into each others eyes for many minutes and she just kept quietly talking to him (in Polish! )..he listened and was interested in everything she said..there was no language barrier. Dot, Aspen's biggest fan by far, is a very spunky, 85-year-old woman (dressed in capris and a sailing t-shirt! ), who was one of the original founders of the Animal Rescue Foundation in Terryville, CT. Not only does she request a special visit each time we are there, she sometimes goes from floor to floor by herself in her wheelchair until she finds which room we are in! Although Aspen's visits touch many people, I truly feel that it means the most to Dot. Having been someone who devoted much of her life to helping stray and abandoned animals and knowing (maybe better than many other animal lovers) the deep, true meaning and importance of the human/animal bond, I simply cannot imagine how empty it must be for this woman not to be able to reach out and feel soft fur whenever she wants. There are, of course, people that do not like cats (however, not too many in this facility). A few are just plain grouchy and say "I don't want to see that thing". But Aspen has managed to convert a large majority of this small group of self-confirmed cat-haters. The scenario many times has gone like this: We walk into a room and say "Hi, we have a visitor for you. Do you like cats?" The person says "No, I hate cats..no use for them..you can't trust them." Then we say "Oh, that's okay but we're just going to see if your roommate wants to visit with him for a while." After watching Aspen's visit with the roommate, on our way out, the confirmed cat-hater almost always says "Hey, bring that cat over here..I don't want him sitting on me, but I want to see what he looks like better." We oblige the request..then you hear "If I wanted to pet him, he's not going to bite me, is he? "..then you hear "Well, you know, I told you I hate cats but do you think that he would sit on my lap? "..and Aspen goes to work again. It's quite funny! However, I find it sad that they have passed through a whole lifetime of missing the warmth, softness, joy and love cats add to your life. We have also done group visits with a gathering of residents in the recreation room. I was somewhat skeptical of this at first but actually found it to be more interesting...with many people asking questions and others responding to my answers...and many people telling the group tales of animals they once loved...and others trying to top those stories! Aspen, in the meantime, will sit with someone for a while and then decide it's time to move to someone else's wheelchair/lap by using their legs as a bridge!..he makes it around the whole room like this. When I started bringing Aspen for therapy visits, I made the comment that the most satisfying thing would be to encounter just one big breakthrough with someone; someone who lives trapped in their mind/body and does not respond to outside stimulus. I didn't know if it would ever happen, but could only hope. My wish has not been long in coming. On our last visit, the aid and I walked into a room of an Alzheimer's patient, with the aid explaining that we'd give it a try but this woman has responded to nothing in a very long time, so we'll make it quick. I put Aspen on her lap and then I took her hand and started making petting motions on him with it. Within seconds she jerked her head down to look at what was on her lap and exclaimed "Oh!" I no longer had to help her pet the cat; she took over all by herself. You could tell this was someone who had petted many a cat in her time..she knew what she was doing...she was so gentle and just kept stroking him over and over; she actually stayed focused on him the whole time. Aspen stayed with her for about 20 minutes. By the time we were done, there were about 10 nurses in the room with us..no one could believe what they were seeing. I asked if I could please take a picture and the aid said to her "Look over there at the camera. "...and she did!!!! Everyone started clapping. I almost started crying. I have found this whole experience very enlightening and am looking forward to continuing to visit with these people and meet new ones. Many of their stories are very interesting; listening to life experiences of those now in the twilight of life is heart-warming. Being able to experience this with my very special Lilac Point guy by my side is awesome! And, true to who Aspen is, he continues to love these new adventures, thrives on all the attention and is bringing lots of smiles to the faces of lonely people. YOU GO, BOY!